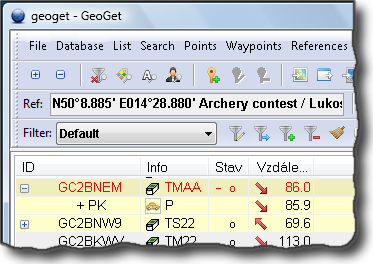 Geoget is a Windows application to operate your own databases of geographic points, with primary focus on the Geocaching, including online links to Geocaching Live. Can be used also with points of Opencaching, or any custom database items, such as selling points of tourist souvenirs, database of historical military fortifications, etc. The database can be searched, points can be edited, group of points can be filtered from the database and then exported them to other programs or devices such as GPS or PDA. Program features can be expanded with system of user scripts. Even though Geoget application itself is in English language (You can add any other localization too! ), this webpage is mostly in Czech language. It is because I have no time to maintain the English web version. Sorry! However I consider english web as important part of Geoget project and I try to improve situation. Please, be patient. You can try use Google Translator on the left side of this page. The results are sometimes funny but will serve the purpose.